It’s been a busy month of baking for me. I know I have shared lot’s of cookies and I still have more cookie recipes to share in the upcoming months. When I bake, I share with my neighbors and my husband takes the rest into work for his sailors. It is a win win for everyone. Are you ready for Halloween? Or even celebrating it? This year our theme is a graveyard with tombstones and skeletons and lights everywhere and a projector on the 3rd floor. Everyone loved that so much last year. We have masks and are looking forward to scaring the local kiddies,lol. I recently made these cupcakes as a donation for a fundraiser. They were a huge hit and all bought out in 7 minutes. This especially dark chocolate is decadent and pillowy soft. Moist and airy. Divine. I got a text message about how did I get the cake so soft and moist,hahaha! Another thing I love about this cupcake is the cake itself is not super sweet. It is wonderful, so when you add the delicious raspberry filling and the vanilla frosting, all 3 combined balance it perfectly for a well rounded dessert with a lot of flavor. Heat oven to 350°F. Line 28 to 30 muffin cups (2-1/2 inches in diameter) with bake cups. Stir together sugar, flour, cocoa, baking powder, baking soda and salt in large bowl. Add eggs, milk, oil and vanilla; beat on medium speed of mixer 2 minutes. Stir in boiling water (batter will be thin). Pour batter into prepared pans or fill cups about ⅔ full with batter. Bake 22 to 25 minutes for cupcakes or until wooden pick inserted in center comes out clean. Cool 10 minutes; remove from pans to wire racks. Cool completely. Before moving onto the filling, using a Cupcake Corer, core each cupcake to be filled! Now fill your cored cupcakes and then make your frosting! Microwave chips and butter on high for 30 second intervals. Making sure to mix then a little so they do not burn. When melted, let cool and then add sour cream, extract and salt. In the bowl of a stand mixer or by hand, gradually add in the confectioners sugar till it is your desired consistency. There is a strange, maybe even odd and certainly random story to tell you about today’s cookie! Today has been a very busy day for us in our preparation for Christmas, especially a Christmas party we are attending tomorrow. I had not picked a Christmas cookie for the day yet and asked my husband if he had any ideas. I went over to my baking books and chose my King Arthur baking book. I’ve not used it as much as I have wanted to. We skimmed the cookies and saw one that we both wanted to try. Then we saw the recipe called for Baker’s Ammonia. Not something I have nor ever heard about. We decided to skip the cookie since getting any special ingredient is not going to happen without purchasing online and waiting 7+ days for it to arrive. I then chose my Fannie cook book, thought we should thumb through it and see if anything called out to us. As Daniel was searching, I noticed a small newspaper clipping sitting in the front of the cook book. Q. An old cookie recipe that’s a favorite of mine calls for baking ammonia. Do you know of a source or a good substitute? A. Baking ammonia, also called “ammonium bicarbonate,” “ammonium carbonate” and “hartshorn” was popular in the first half of the century before baking powder was widely available. Substitute 1 teaspoon baking powder plus 1 teaspoon baking soda for 1 teaspoon baking ammonia. 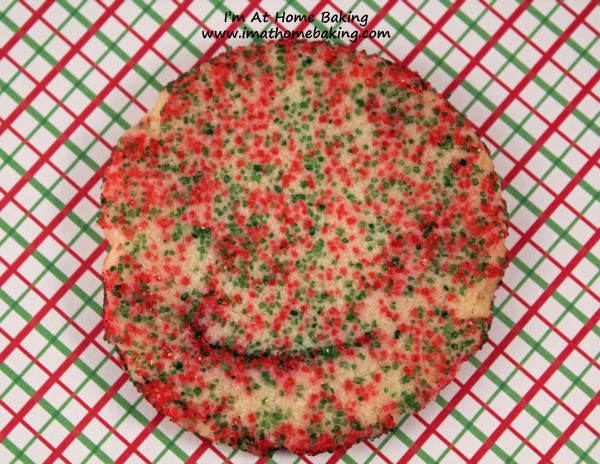 We both knew in an instant that baking this cookie was meant to be! May sound cheesy or whatever but seriously…it was meant to be,lol. These are very yummy and on the sweet side too but so very delicious and crisp. We chose to use red & green colored sugar to make it more festive for Christmas! One package arrived today! It was Daniel’s Christmas Eve gift, so I am very happy it came. We are still waiting on several more packages and we have a few more days! Also, it is snowing after having some rain! I hope it snows all night! Combine the vanilla, baker's ammonia, and salt in a very small bowl. Stir to dissolve the ammonia; the salt won't fully dissolve. Combine the vanilla mixture with the butter and sugar, and beat till smooth. Mix in the flour; the mixture will seem quite dry at first. Continue beating until the dough comes together. Break off pieces of dough about the size of a shelled chestnut (about ½ ounce); a teaspoon cookie scoop works well here. Roll the pieces into balls. Space them no the prepared baking sheets, leaving 1½" between them. For somewhat sweeter cookies with the added crunch of sugar topping, roll them in coarse or granulated sugar before placing them on the baking sheets. Use the bottom of a glass, dipped in sugar if necessary to prevent sticking, to flatten the balls to about ⅜" thick. If you have it, use the end of the food pusher from a food processor; many of these have a circular, ridged pattern on their end, which imprints the cookies with a nice design. Bake the cookies until they're a very light golden brown around the edges, about 30 minutes.